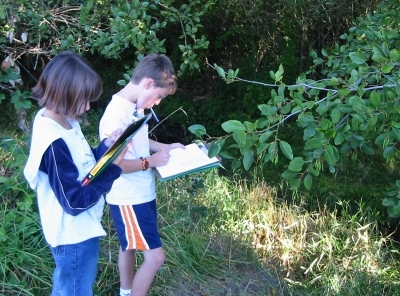 Fifth grade students spent the fall of 2003 learning how to use a tree identification key and identified all of the trees on one side of Dixon Creek. Jerry Heilman, from the Conservation Biology Institute, and parent volunteers helped the students with determining tree type as well as mapping tree locations. A map (PDF format 2,672 KB) of the tree inventory results can be viewed or downloaded here. A spreadsheet (Excel 97 format) with tree species and size information can viewed or downloaded here or a PDF version of the spreadsheet can be viewed or downloaded here. The tree identification numbers listed on the map can be used with the tree identification numbers on the spreadsheet to locate specific tree information.